The events are all in one table with an id, a date, a name, and a little bit longer comment. In this sample I have entered information about FileMaker versions (the dates are approximated) in an Events table. The information is from Wikipedia, and this blog. Month(EventDate) & ", " & Day (EventDate) & "), content: '" & Content & "'}"
Update 2018-07-30: The calculation is now using JSONSetElement introduced in version 16. I have an interface table, TimeLine, with a global text field, gHTML, where I have copied the HTML code from ”basic example” found at the VisJS web page. The links to the library itself and its CSS are changed to a CDN, which means you will need internet access when you open the database in order to show the timeline. The formula substitutes my placeholder in the HTML template with real data. All the JSON events for all event records are assembled with the List function. I use a cartesian relation to get all the events from the Events table. All new lines are also replaced by a comma (you can’t have new lines in the content field) just to make it valid JSON. 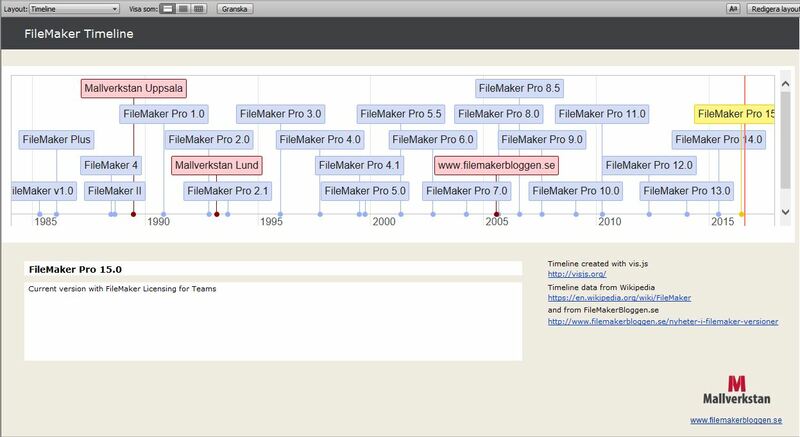 Information about the selected ”FileMaker Pro 15” event in yellow is displayed below the timeline. Please feel free to download a sample database and add whatever events you like. Update 2018-06-15: In FileMaker 16 and later you need to allow the privilegie ”fmurlscript” otherwise it doesn’t work. The web viewer in Windows use an older version of Internet Explorer which can’t handle web sockets. To make it work in FileMaker for Windows a jQuery selector is added. Update 2018-07-30: The function JSONSetElement is now used to create the JSON data. 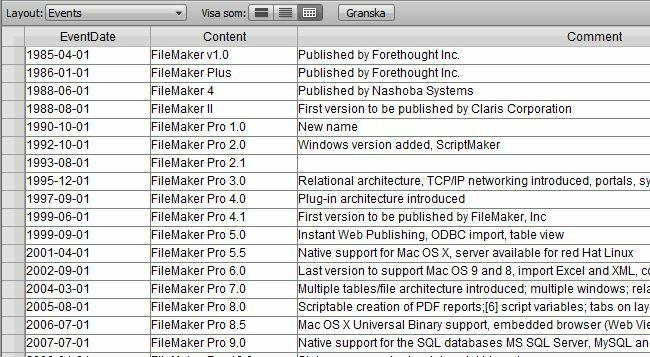 Download Timeline3.fmp12 (updated 2018-07-30) You will need FileMaker 16 or later. Works fine in FileMaker but I can’t see the timeline in Webdirect mode. The Webviewer area Stays empty. By trying the htmlcode directly in a web browser works fine. Du you have any solution? I believe it only works in FileMaker Pro. And works in FileMaker Go too !!!! Thanks Rolf – this is great! Hi Rolf, really nice done! Didn’t know that I needed something like this in a project till now. Very nice to have an overview of an accreditation process in this way, a picture says 100times more than a couple of dates… THX!